If you’re an entrepreneur, it’s pretty likely that you’ve contemplated the idea of giving up on your business. I know that I have. And in the world of ambitious entrepreneurs, I’ve made some amazing biz besties along the way who have felt the same. 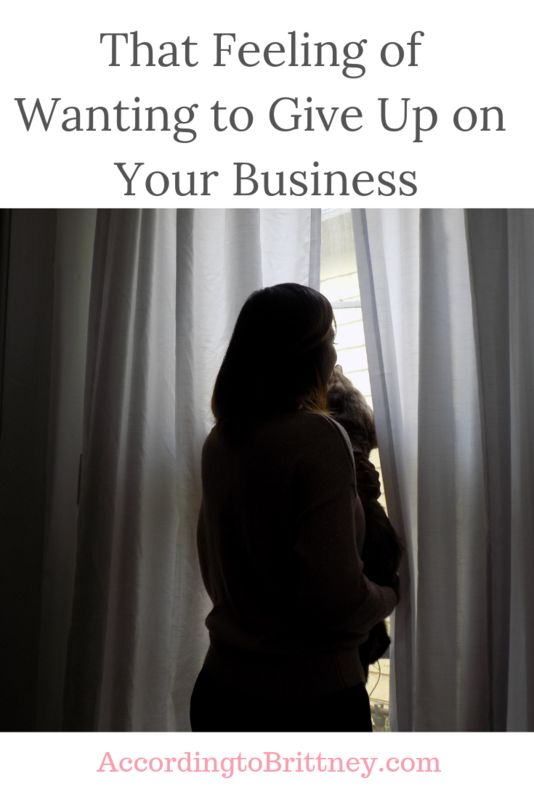 Running a business is hard especially with so many other situations like family, jobs, and money. I wanted to share my story on giving up because I came so close to throwing in the towel, but I’m so glad that I didn’t. In November of 2018, I was extremely discouraged. There was barely any money coming in, yet I was overwhelmed with things to do. I had no motivation to do anything business related. There was this huge cloud of doubt and fear following me everywhere. I even contemplated what I would do instead of being a content writer and social media strategist. Let’s just say that being a Sims 4 gaming streamer, sounded really good at the time. So here I am, depresses, stressed and looking for what’s next. This has happened to me before when I was so anxious and sad that my business seemed impossible and I knew it would happen again. So, I had to make a decision. I could just do what my mind is telling me and give up. Or I could accept that I feel this way and keep moving with what my heart desires. You see, running a business is a huge risk. So, naturally our brains try to keep us safe from big risks. And it will throw anything our way to keep us from danger. But, it’s up to us to tell our brains that we are safe and this is a good risk to take (even when it doesn’t feel that way to us). Okay, so I did something I literally never do. I opened up and shared with my biz besties, my family any stranger who would listen that I was struggling (pause for gasps). There were tearful sessions with my business coach and I even hired a mindset coach. This is unlike me. I’m not someone who shares their struggles, but I realized this was necessary for my healing and to be able to bounce back from what I was dealing with. Let me tell you. When I did this, it was like i was telling the universe, “You can’t get rid of me that easily. I was made for this.” And then the universe was like, “Okay girl! I was just testing you, let’s get back to killing it. Then, I started getting new clients, partnering on some amazing collaborations and feeling better about all the things. December 2018, I had my first 4 figure month! January 2019, I’m already set to pass that. If I would’ve given up, I wouldn’t have know what’s in store for me. I wouldn’t have found my killer clients that make me excited about my business. I wouldn’t have this exact opposite overwhelmingly good feeling about the future. That feeling of giving up is normal, natural, and apart of the process. What makes us successful, is our willingness to push past it.